Try this breakfast friendly take on the dessert crisp! 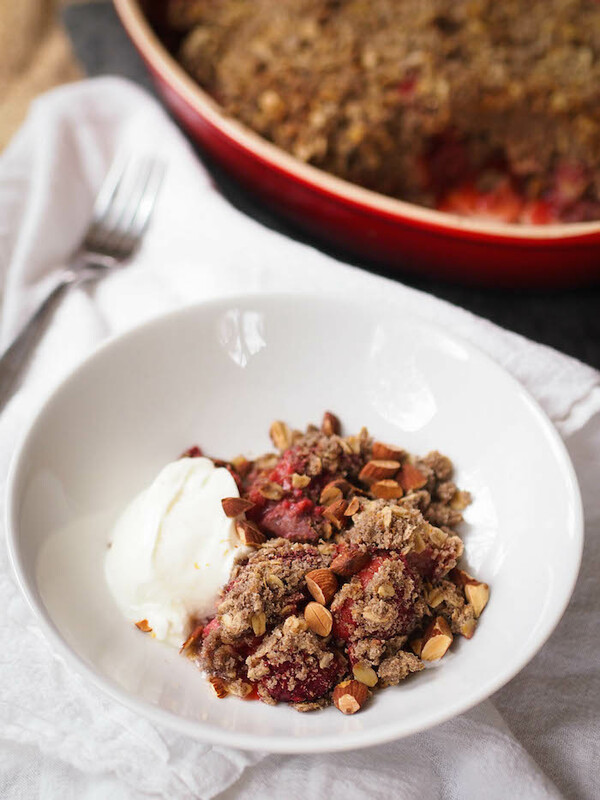 This strawberry and rhubarb breakfast crisp is made with whole grains, frozen fruit and lightly sweetened! Y'all know how I feel about all the 'New Year, New You' craziness. If not, let me sum it up. There's no need for a new you because current you is pretty cool. Let's resolve to treat current you to an amazing year. Now, here is one new thing for the new year that I can get down with and that's this month's Recipe Redux theme: A New Ingredient for the New Year. This one was actually surprisingly hard. Weird ingredients are kind of my thing. Short of picking up something for shock value (offal anyone? I bet a tripe recipe would bring in tons of blog traffic! ), I was really having a hard time thinking of anything that was new to me. So, I gave up and started thinking of breakfast. Per usual. 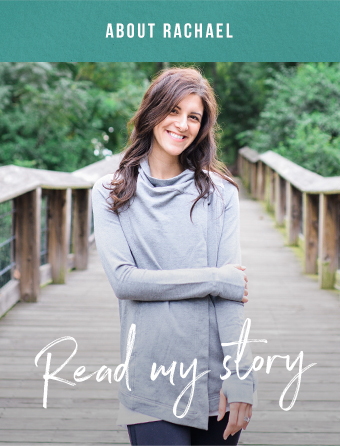 Last month I mentioned my goal of sharing more 'formula' meals versus set recipes. Breakfast crisp is one formula meal that's been getting a lot of airplay in our house. It's basically the same thing as a dessert crisp, but made with whole grains, less sugar and is served with plain yogurt instead of ice cream. I mean, muffins are basically socially acceptable breakfast cake, so why not breakfast crisp?? I know people say baking is a science. Usually that's true, but with crisp, I never measure ingredients. Well, except for this post. But please know this is a pretty intuitive 'recipe'. All I do is toss frozen fruit, a little lemon juice and/or zest, a sprinkle of sugar and a tablespoon of any kind of flour in a baking dish. Then I top it with a mixture of flour, oats, a tiny bit more sugar and enough coconut oil to form crumbles. Sprinkle it over the top and bake at 375 for 40ish minutes. Easy peasy, right? You can use any fruit you like. About 4ish cups works great. I use frozen for convenience sake, but fresh obviously fresh works too. For flour, I used gluten free buckwheat flour because I've got two big bags on hand, and I love it's earthy flavor. Normally I use whole wheat or spelt flour, but you could also do almond meal or oat flour. No rules here! I usually mix a half cup or so of chopped nuts into the crumble and would have thrown some almonds in there if I had remembered. So yeah, back to that new ingredient. 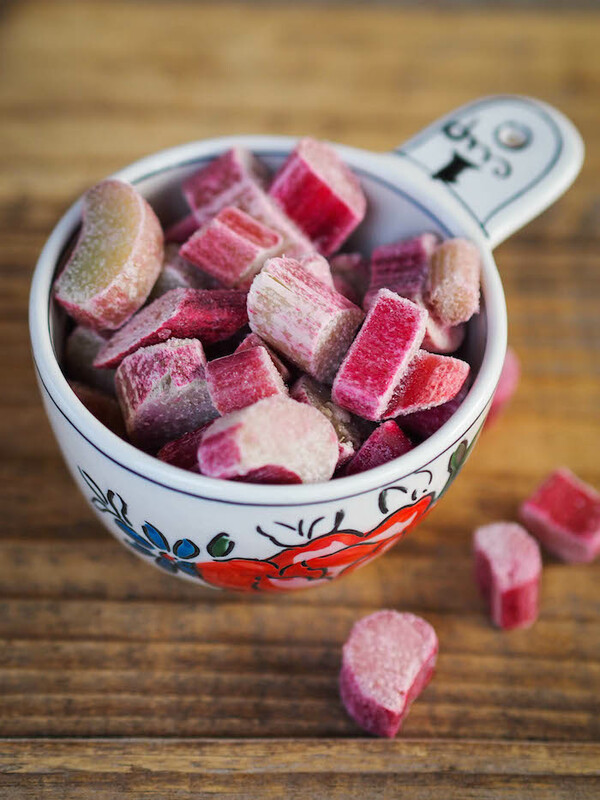 When I was shopping for my crisp, I ran across frozen rhubarb, a fruit (or is it a vegetable) I've never cooked with or even tried before. I'd heard it has a sweet-tart flavor and I just love tart, so there we go. My new food conundrum was solved! Hope this breakfast crisp becomes a regular in your house too! In a large baking dish, combine fruit with lemon juice, buckwheat flour and sugar. In a medium bowl, mix oats, flour, sugar, and salt. Mix in coconut oil with fingers or a fork until it sticks together. 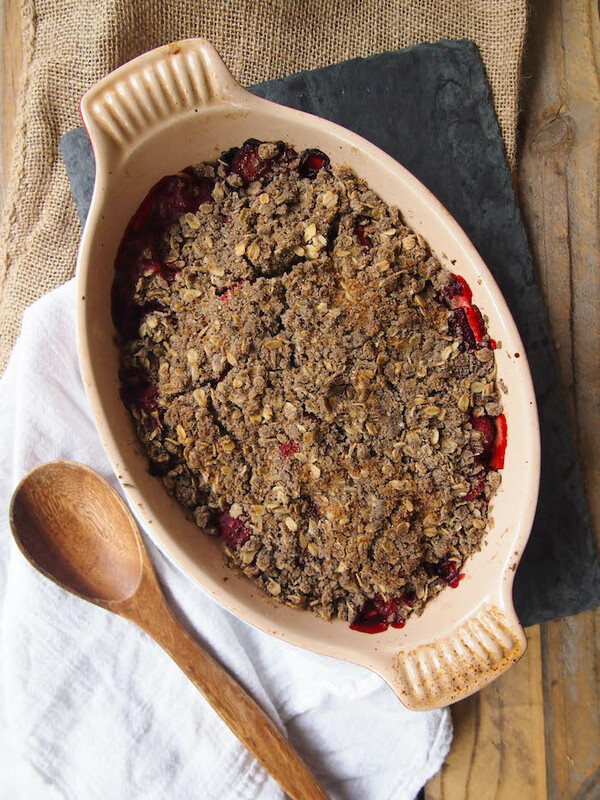 Crumble over the top of the fruit and place in the oven. Bake 40-45 minutes until bubbly and golden. Serve warm, room temperature (or cold right out of the fridge!) with yogurt.